December 5, 1938: "EXECUTIVE ORDER"
"Withdrawal of Public Land for Forest Lookout Station - Wyoming"
Sixth Principal Meridian - T. 13 N., R. 77 W., sec. 13, SE1/4NE1/4, N1/2SE1/4, 120 acres. Section 2. Subject to valid existing rights, the tract of land described in section 1 of this order is hereby temporarily withdrawn from settlement, location, sale or entry and reserved for use by the Forest Service of the Department of Agriculture as a fire-lookout station in connection with the administration of the Medicine Bow National Forest. Section 3. The withdrawal made by section 2 of this order shall remain in force until revoked by the President or by act of Congress. June 20, 1953: "Miss Lola Falkenhain and Miss Elizabeth Sinclair have opened the Jelm Mountain fire lookout station on 9,665 foot Jelm Mountain in the Medicine Bow National Forest in Wyoming. 1964: A new R-6 flat roof cab was constructed on an eight foot high cinder block enclosed foundation to replace the earlier L-4 ground cabin. August 1, 1935: "For the first time in history, one of the three mountain fire lookout stations in Yellowstone Park is to have that "domestic touch." 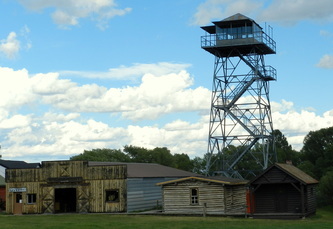 The lookout was moved to the Museum from Slash Ridge, an administrative site of the Medicine Bow National Forest. 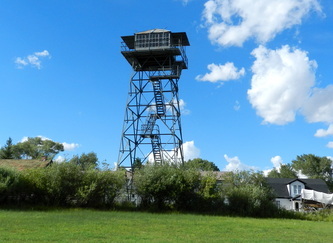 August 2014: Volunteers through the Forest Service Heritage Program refurbished the tower, which has been in need of maintenance for some time.